Hey there fam! I found a website that lists all sorts of MEME's called "The Daily MEME". Click on the keyboard pic on the sidebar to check it out. It has all sorts of daily questionnaire's that you can fill out and post on here. All you have to do it copy and paste. Simple right? Well I thought it might get us typing on here more often and testing our knowledge of one another. At any rate it could be fun right? Right? What are your feelings about milk? Love it! Especially on cereal or in chocolate milk form. What are your feelings about cheese? Ummmmm....cheeeeessssseeeee! Can't get enough. Neither can Carlee. What are your feelings about yogurt? The kids and I eat it almost daily. I always have to have Yoplait Key Lime pie flavor on hand for Collin. How do you feel about soy milk? Don't really like it on its own but it is awesome mixed into shakes. Man I miss my blender!! How far are you from the nearest cow? Yeah, just look out any of my windows from the front of the house. You can always see them in the field just across the road. So there you have it. Intellectually stimulating I must say. Will anyone else post one too? Only time will tell. You don't even have to do one every day (unless you want to) but hopefully you guys will fill one out once in awhile! 1. What are your feelings about milk? 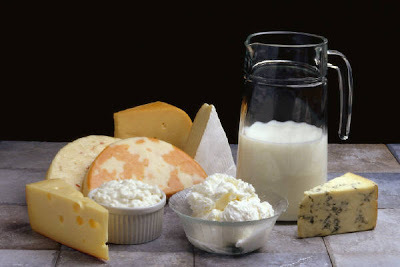 A vile concoction necessary for calcium, and for the creation of cheese. 2. What are your feelings about cheese? Goes well on burgers. 3. What are your feelings about yogurt? The only other form of dairy I'll consume besides cheese. 4. How do you feel about soy milk? As long as I don't have to drink it, or know it exists, I'll stay blissfully ignorant. 5. How far are you from the nearest cow? The farther the better. They are disgusting beasts but I take pleasure in consuming them. Take that PETA! You arrogant pieces of cow droppings. And if anyone agrees with PETA, or supports them in anyway, keep me ignorant of that fact, thanks. 1. What are your feelings about milk? I love milk except when I'm having allergy problems. Too much phlem!! 2. What are your feelings about cheese? It's great on mexican food and pizza!!! 3. What are your feelings about yogurt? I eat it when I got it!! 4. How do you feel about soy milk? I still haven't tried it, so I can't say!! 5. How far are you from the nearest cow? They are all around me!!! Mmmmm....beef!! See? This is entertaining already!